Judge William Alsup of the U.S. District Court for the Northern District of California just entered an order that formally addresses both parties -- Oracle and Google -- but substantively agrees with Oracle and, between the lines, tells Google not to try to confuse the jury. Today's order relates to color-coded handouts that the judge wanted the parties to produce in order to "assist the jury in comprehending the issues and evidence" by showing each asserted patent claim on a separate page and highlighting passages that are key to the jury's determinations of (in)validity and (non-)infringement. Even though the court has not yet set a new trial date and Google has asked the Court of Appeals for the Federal Circuit to intervene on the Lindholm email issue, preparations for a trial are continuing. A different order, entered yesterday, indicates that the judge intends to hold the final pre-trial conference on or around December 21, 2011. Three weeks ago, he asked for these color-coded handouts to be filed by November 18. For the do-over ordered today, he gives the parties until the end of this month. There are three colors as per the judge's order: gray, blue, and pink. Gray and blue are the colors used by Oracle to indicate which elements of a patent claim are missing from one or both of Google's best two prior art references (gray relates to reference no. 1, blue to reference no. 2, and as you can see in the example above, some passages may be claimed to be missing from both of them). Hence, gray and blue have to do with Google's invalidity contentions. Pink is about infringement. It's the color to be used by Google to highlight each phrase in the language of the patent claim that it claims describes something that's missing from Android. In order for a given technology to infringe a patent claim, it must practice all of the limitations set forth in that claim. The handouts required some degree of cooperation between both parties. In the first step, Google had to identify its best two prior art references for each claim. That led to the first disagreement. In a letter to Judge Alsup filed yesterday, Oracle's counsel complained that "[i]nstead of identifying only anticipatory references, however, Google chose also to identify obviousness combinations". Here's what it means: instead of saying that a particular patent or publication anticipated the relevant Oracle patent application, Google argues that Oracle's patent claims are obvious if one considers certain combinations of different pieces of prior art. 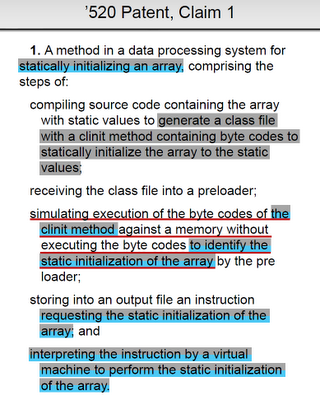 Oracle told the judge that such obviousness combinations make the issue too complex for this kind of illustration. "There seems to be confusion between the parties regarding whether obviousness combinations should be allowed in the color-coded handout. They should not be. The color-coded handouts are strictly for evaluating anticipation by single references. Please conform accordingly." The above wording is succinct and polite, but the judge may have been annoyed, given that his original order only mentioned anticipation and not obviousness combinations. "The parties should also include a legend on each page that identifies the meaning of the red lining, and the blue and gray highlighting with the names of anticipatory references, such as 'missing from Android' and 'missing from Reference X.'" I don't mean to overstate the importance of this dispute over the reasoning behind and layout of the color-coded handout. The handout will be corrected, and Google will still have every chance to defend itself against Oracle's allegations. But it's interesting that Oracle advocates ways to help the jury to understand the issues while Google favors confusion and obfuscation. This strongly suggests that Oracle is more confident of its case than Google is.